Desperate to escape New York but can’t afford a beach vacation for the entire family? Consider a trip from March 3-4 to The New York Times travel show where for just $15 (kids enter free) you can go around the world at the Jacob Javits Center. There is an amazing variety of people and places in store: You can go to Israel and eat tasty olives and chips; dig sand art in the Caribbean; watch penguins waddle at Sea World; dance on a stage with teenagers from South Africa, (which we did this last year, and, in exchange, received tee shirts and hugs). You and your kids will love the experience. At least mine do. We’ve gone for two years and will go again this weekend. Our route around the convention center is circuitous. I wish I could advise you on the best route to travel the convention hall, but we just wander to different regions, from Alabama to Zimbabwe. We stumble upon good advice and useful information. We learn how Peace House in Tanzania builds schools; how the plays of George Bernard Shaw changed social justice attitudes in Ireland; and how easily you can obtain a tourist visa to Cuba. There is a holiday atmosphere to the travel show, as if all of the vendors, performers and travelers are a big cruise ship, sailing through a winter weekend into spring. Last year, when we entered, I bumped into my coworker, Dan Licardo, who was there with his two daughters. He was lugging a bag so full of giveaways he could hardly carry it. We grabbed our own booty bags, from the first booth in our eyesight, India, and began collecting booty. 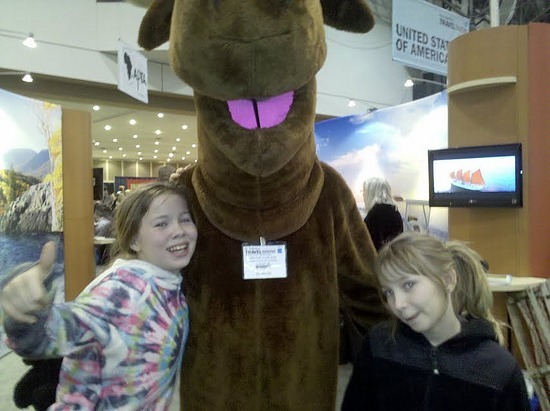 At almost every booth, my 10-year old twin girls picked up free stuff – candy, mousepads, bags and pens. I drew the line at glossy brochures. I tried to impress my daughters with my knowledge that what we were collecting was called SWAG – stuff we all get. But they weren’t listening; they were collecting brochures. At the Indonesia booth, a nice lady gave us magnets of a rice field. Occasionally, even today, I approach my refrigerator door with the thought, ‘We ought to travel to Indonesia. People are super nice there.’ I like nice. My girls scaled a climbing wall so many times I got a neck ache, watching them ring the bell at the top of the wall. I even tried it and made it to the top to ding the bell. It’s unclear to me which state or country paid for the climbing wall. I do know that nearby Ecuador gave away Frisbees, because we still use them. We should visit Ecuador. The climbing wall was near the best state in the union, which according to the people of Maine, is Maine. In Maine’s vast exhibit area, a watercolor artist painted a beach scene; a moose mascot roamed around; and a textile artist spun wool. Okay, I was convinced. Maine is the best state in the union. The first year we attended, the highlight for my twin daughters was scuba diving in a warm (and small) pool. We donned the wet suits they provided in some makeshift tents, signed waivers, and learned to breathe underwater from two hot young scuba instructors. We dove for plastic fish and smiled at each other through our masks. Afterwards, we learned there are scuba schools in New York and we almost signed up, but instead, we took a brochure. People smiled as we exited the pool area, not rushing us at all. There was a friendliness between fellow travelers that you don’t encounter at an airport or in a foreign country when you’re traveling with kids. Maybe it’s because there’s no need to rush in an exhibit hall. Or maybe it’s because you’re traveling the world, yet you know you can sleep in your own bed at night. There are stages with world music performers, panels with international chefs and book signings with travel writers but, due to my kids’ restless pursuit of SWAG, I’ve never attended any of these. Maybe this year. I did have a celebrity-sighting thrill when I met a favorite writer whom I read in the New Yorker and follow on Twitter, Susan Orlean, as she came up the escalator with me. “I love your work,” I told her sheepishly. Damn, I thought, she’s talented AND pretty. “Thanks. I’d like to chat. But I lost my boots somewhere.” She yelled down to her husband who was holding their son’s hand at the bottom of the escalator. “I can’t find my boots!” Ah great, I thought, talented, pretty AND disorganized. Just like me! NICE! “You’re going to need them,” I said, looking out to the city street where the snow swirled around Manhattan, turning to slush as it hit. I wasn’t quite ready to hit the dirty, snowy city streets yet. Fortunately, at that moment, Dan spotted me. He called, “Mary Beth, they’re giving out shots of rum in the Caribbean.” I joined him back at the Bahamas. < Previous What’s wrong with intentional community? What a great idea. I wish I knew earlier. Too bad I’m busy. Hope you have fun.